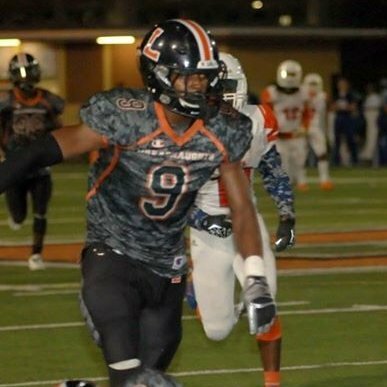 Jaqurius Smith (good name), a 6-3 194 pound LB from Lakeland, FL has Tweeted he's received an offer from UMass. "Smith, 6-foot-2, 200 pounds, is a rangy outside linebacker that does a great job of reading and reacting to the football. Smith diagnoses the play, and then accelerates to initiate contact with his opponent. Impressive athlete for the position that can operate in space. He can continue to work on his explosiveness. " Smith has seven FBS offers including Syracuse from the Northeast. This article from News Advance.com reports Coach Whipple and AD Ryan Bamford have discussed adding Liberty to future UMass schedules. The article states Whipple and Bamford will meet this weekend to discuss future scheduling. Liberty is in Lynchburg, Va if you've forgotten. BTW, the Flames are in the process of a $1 billion dollar facilities construction that includes a indoor football practice facility. The Flames are serious about their football. UMass, Liberty, Army and New Mexico State could form a unofficial mini-conference. It would sure make scheduling easier. ESPN predicts Mississippi State has a 95% chance of win against the Minutemen when they meet on November 4th, 2017. Appalachian State lost five commitments to Power Five teams late in last year's recruiting period. The App State coaching trust thinks the new recruiting rules could help Group-of-Five schools. Jarvis Ware, a 5-11 170 pound DB from Apopka, FL has Tweeted he's received an offer from UMass. "Ware, who is a rising star as a cover corner with good size and ball skills, says it is his role to be one others can follow on his team. "I feel like I'm a good teammate and I motivate others to compete," he said. "I feel like I'm a leader on the defensive side of the ball." Received a 98.94 rating in a Nike camp (scroll down about 25% of the list). This article features Ware and his offer from Oregon. Ware only has three offers, but two are from Southern Mississippi and Oregon. Jaeveyon Morton, a 5-9 160 pound DB/Athlete from Detroit, MI has Tweeted he's received an offer from UMass. Partial quote from a Scout.com report dated 04/11/17 on the Cleveland Opening Original (a skills camp) by Allen Trieu. 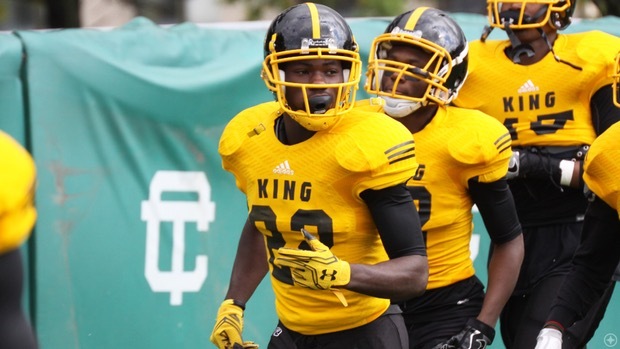 "Jaevon Morton from Detroit King won MVP and deservedly so. 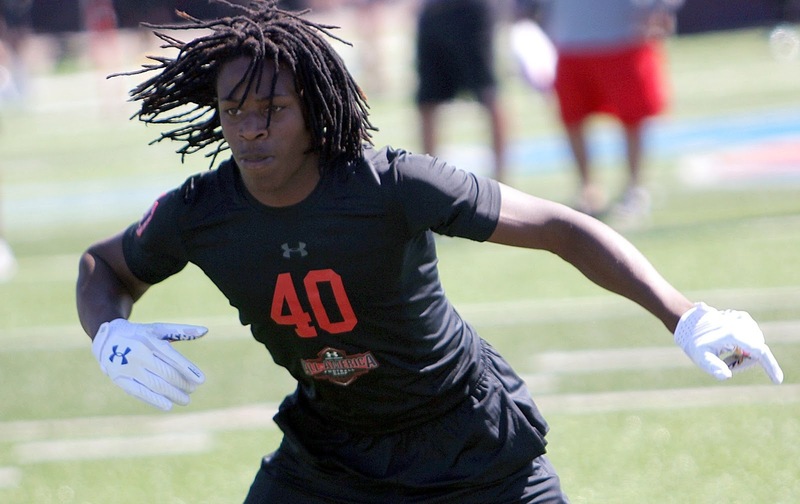 A kid with double-digit offers, Morton has good speed and is very physical." Morton has fifteen offers including most of the MAC and Syracuse, Rutgers and Temple from the Northeast. 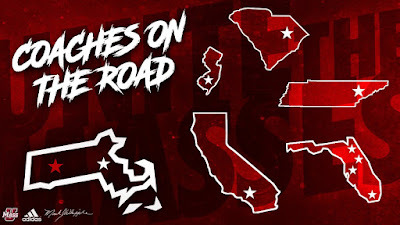 UMass football coaches cover the country recruiting. "If i ask how fast a kid is and you tell me he's 4.3, don't be offended when i offer to sell you 1 of the 3 condos i own in Dubai ." Check out this video from UMass Sports Net. Hawaii will ditch white helmets for the 2017 season. ESPN lays off more than 100 employees. Digital add spending jumps to record $72.5 billion in 2016. Mike Traini of "Fight Massachusetts" report UMass has added Tyris Lebeau, a 6-2 200 pound Safety from Vanier College to the Minutemen's 2017 class. 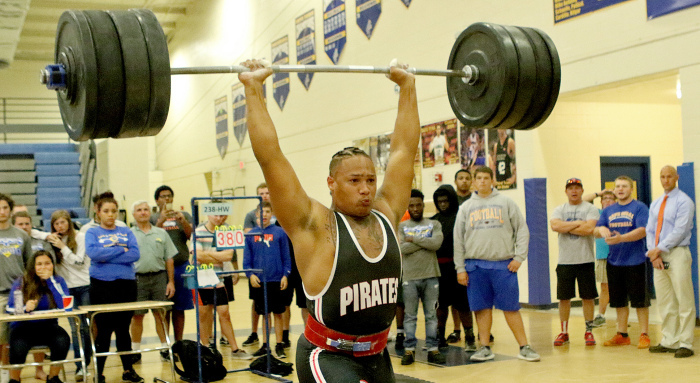 NCSA has his recruiting profile. This article from canadafootballchat.com features Lebeau. Adam Breneman is excited to be playing at Fenway Park. 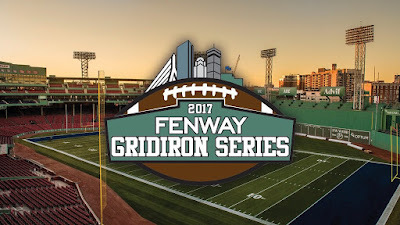 The Boston Herald covers area teams playing in Fenway this fall. The Maine Black Bears says playing old rival UMass will be great. NESN reports college football is returning to Fenway Park. Jack Driscoll gets some coverage from the New Haven Register in an article about the Fenway series. The Hartford Courant looks at UConn's date with Boston College at Fenway. Georgia Southern HC Tyson Summers is excited about the Eagles' direction. UMass plays Georgia Southern at McGuirk on October 21st. Michael Lewis, a 6-6 235 pound DE from Jonesborough, TN has Tweeted he's received an offer from UMass. Lewis has ten offers including Army and Navy from the Northeast. The Orlando Sentinel ranks UMass #125 going into the 2017 season. UMass coaches are out combing the country for recruits. BYU has a lineman who's 6-7 410. Doesn't seem as if he's a very good athlete though. I'll take UMass Raquan Thomas who looks to be a four-year starter at 6-5 392. Temple football looks to run the rock in 2017. The Oracle has five predictions for USF football in 2017. THE APOCALYPSE, IT'S REALLY CLOSE. Mrs Blog and I were up in southern Maine for the day yesterday. We stopped at Mike's Clam Shack seafood store to get some lobster meat to take home. Lobster chunks were $59.95/pound (and no, that's not a typo). Jorien Vallien, a 6-2 184 pound WR from Alexandria, LA has Tweeted he's received an offer from UMass. "As a junior, Vallien had a highly productive season that he nonetheless felt didn't fully realize his expectations. He was credited with 63 catches for 1,001 yards and 11 touchdown receptions in only nine games, but Alexandria went 6-6 overall. Vallien said he'll work on speed and getting his body in the best shape possible for his senior year. He'd like to gain 10-15 pounds and be able to use that extra size and strength on the field." Vallien has fifteen offers with UMass as the only team from the Northeast. 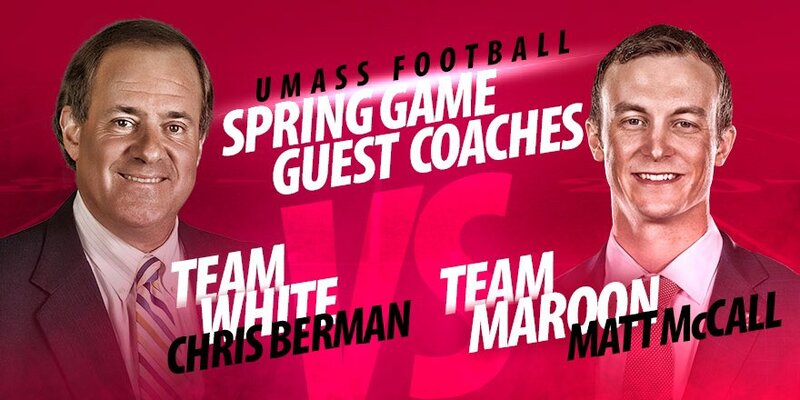 UnderDog Dynasty takes a positive look on the UMass Spring game. Blake Frohnapfel attends the Spring game at Marshall. Nick Souza of the UMass Daily Collegian liked his time covering UMass Sports. Five Tennessee Vols who stood out in the Spring game. 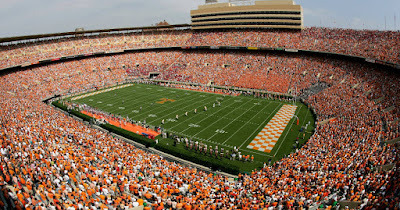 UMass visits Knoxville on September 23rd. Mrs Blog and I will be there. UnderDog Dynasty recaps Temple's Spring game. We're going to be there too. 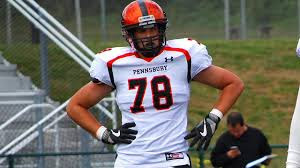 Back on March 20th, 2017 I blogged about Matt Rosso, a 6-6 260 pound OL from Fairless Hills, PA. 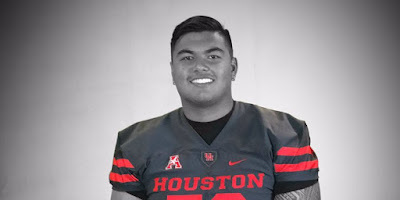 This article from Wednesday by Scout.com updates his recruiting. "Syracuse and Boston College are both pushing for visits so they can see Rosso and get to know him better. "They want me to come there but I just don't know when," he said. "They'll probably want me to camp." Rosso speaks the most with coaches from Virginia and UMass, but Temple is paying close attention." Rosso currently holds offers from UMass and Virginia. Spring game highlights. Be sure to watch the opening two plays: Ford to Brennon Dingle. Also see Cycoby Burch's NFL-style toe tap his second INT. Mike Traini of "Fight Massachusetts" has a nice write-up on the Spring game. The UMass Daily Collegian also has a post covering the game. Chris Berman's visit made ESPN. Thanks to the UMMB for attending the game. I like the band music better than the canned stuff the speakers play. Click on the images and Blogger displays a larger view. Dan Malone has a post on the Spring Game. Matty Vautour covers the Spring Game. Matty also has Chris Berman enjoyed coaching the Spring Game. UMass's write-up on the game here. I'll have a web album up in a day or so. As both Malone and Vautour said, with a split squad it the game was more of less a scrimmage. However, I thought a couple of players stood out. We've been hearing Brennon Dingle was good. In the Spring game he was the best offensive player on the field. He went 8-109 including a nifty opening series from Andrew Ford. UMass fans are going to like him. On defense, I thought Cycoby Burch stood out. He's another three-star recruit who redshirted last year. Burch finished the night with 2 INT's 4 UT's and 1 BKUP. The Minutemen defensive secondary was a liability last year. Burch looked like an impact player among defensive backs. Marquis Young looked bigger and stronger running the ball. JUCO QB Michael Curtis and Randall West floated some passes that led to interceptions. Ford only played one or two series. Many potential starters sat out the game or played only a little. How Kansas State's Bill Snyder's unconventional recruiting strategy keeps the Wildcats competitive. UMass' situation is similar to Kansas State's. Both schools need all the recruiting streams they can manage. April 20th, 2017---Spring Game Day! 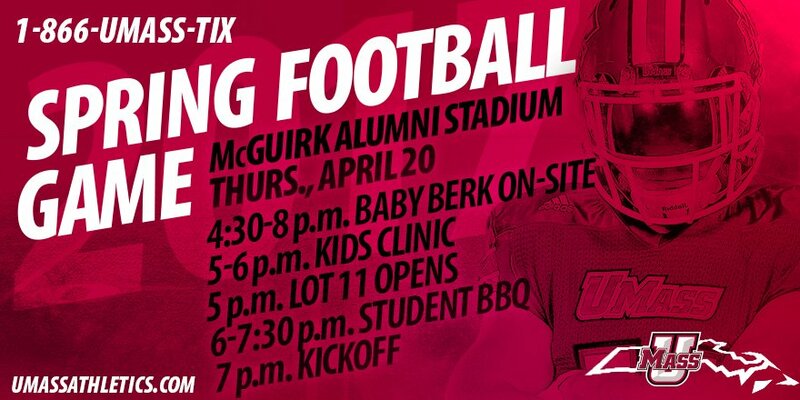 Hope to see everyone at the Spring Game tonight. 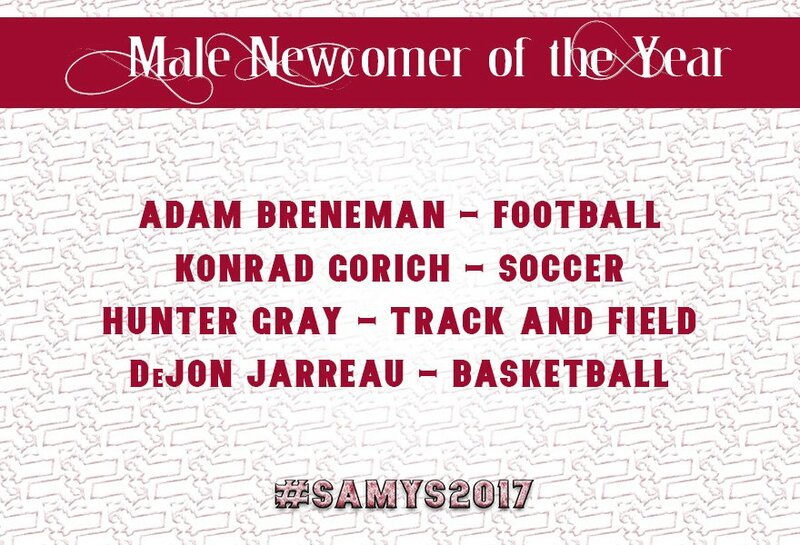 It's also an excellent time to renew or join the Gridiron Club. I just got my "thank you for your recent donation" letter from the athletic dept yesterday. If you can't afford the basic membership, send any donation. Your name on the football donor list really helps in the culture wars. They'd probably rather have 100 people send $10 than one person send $1000. Being a member shows people care about the program. Your name has a real "force multiplier" effect. Help UMass football win. 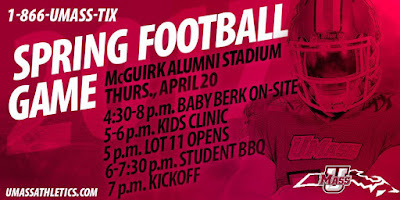 Details on the Spring game here. 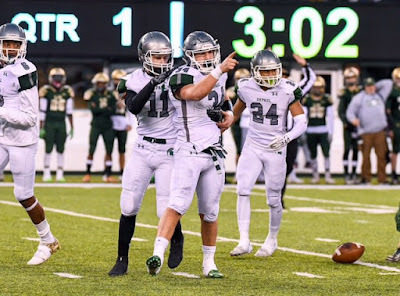 Matty Vautour has a post on the Spring game. He notes Shane Huber (still rehabbing a torn ACL) plus Ali Ali-Musa, DaSean Downey and Sha-Ki Holines will all sit out the game. Those are four defensive starters, so hopefully they'll all be ready to go by summer. Dawgnation.com has details of the contract UMass received for playing at Georgia in 2018. UMass' last opponent of the coming season BYU, will feature running backs by committee. Vinny DePalma, a 6-1 215 pound LB from Wayne, NJ has Tweeted he's received an offer from UMass. USA Today First Team All-New Jersey. DePalma has nine offers including BC, Temple, Navy, Pitt, Rutgers and Buffalo from the Northeast. The weather forecast for the Spring game is improving. The rain is supposed to hold off until Thursday night. Georgia announces their 2018 schedule including UMass at the Dogs on November 17th, 2018. A Notre Dame blog recalls QB Brandon Wimbush's 58 yard run against the Minutemen in 2015. The Virginia Pilot says the media merger of ASN is good news for Conference USA. Lavel Dumont, a 6-4 270 pound OL from Tampa, FL has Tweeted he's received an offer from UMass. Dumont has ten offers including Toledo and Central Michigan from the MAC. UMass is currently his only offer from the Northeast. The UConn newspaper looks at the UMass-UConn rivalry. Wikipedia actually has an entry on UMass-UConn. The three New England schools should make a concerted effort to play each other in as many sports as possible. Fan interest is low at all three schools. UConn will probably be picked last in the AAC in football when the college football magazines come out in June. 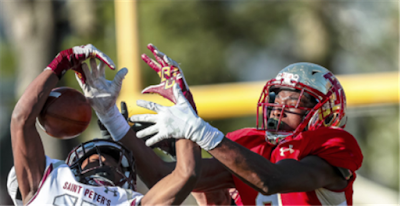 BC's football 2017 recruiting class was last in the ACC (for the fifth consecutive year). UConn's was 10th in the AAC. There should be a three-team "New England" championship every year. Throw in hockey and basketball. Add the Olympic sports. Have a trophy for football, hockey and basketball and one for all-sports total. Mississippi State goes for a defensive makeover. With the Raiders moving to Las Vegas, the BYU Cougars eye playing in the Raiders stadium. The Athens Post profiles Ohio QB Nathan Rourke. 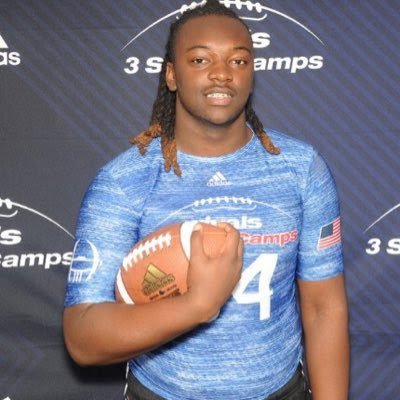 Dante Burke, a 6-4 220 pound DE from Virginia Beach, VA has Tweeted he's received an offer from UMass. Burke has ten FBS offers including Temple and Rutgers from the Northeast. Uh, Oh. The weather is looking iffy for Thursday's Spring Game. 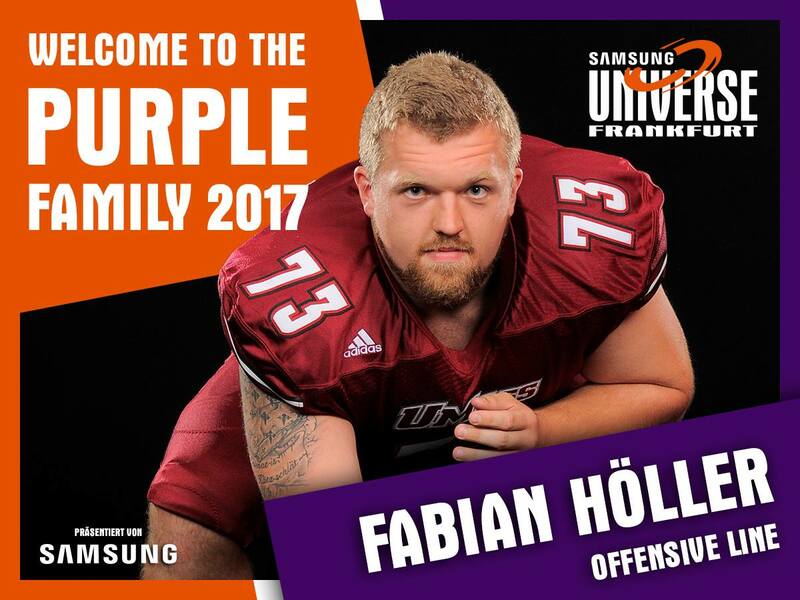 Fabian Hoeller will join the Frankfurt Universe after he graduates in June. Good luck to Fabian! The Universe is part of the European Football league. If you missed it Becca Longo became the first woman player to ever sign a scholarship offer by a DII school or higher. 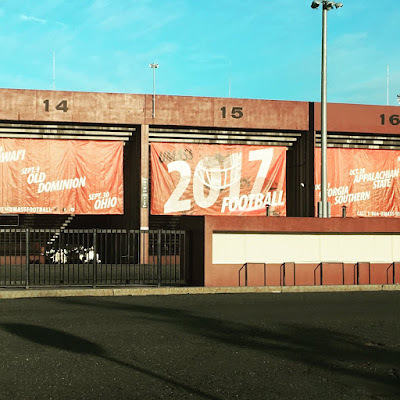 SB Nation previews the 2017 Hawaii football team and their schedule. Appalachian State players get rings for their second consecutive Sun Belt championship and Camellia Bowl win. 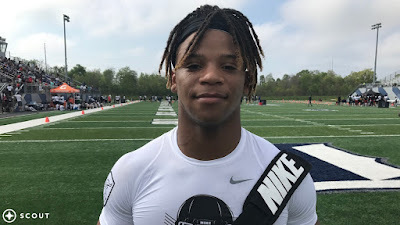 Javontae Jean-Baptiste, a 6-5 205 OLB/Safety from Bergan Catholic HS in NJ has Tweeted he's received an offer from UMass. Besides UMass, Jean-Baptiste has FBS offers from BC, UCF and Bowling Green. 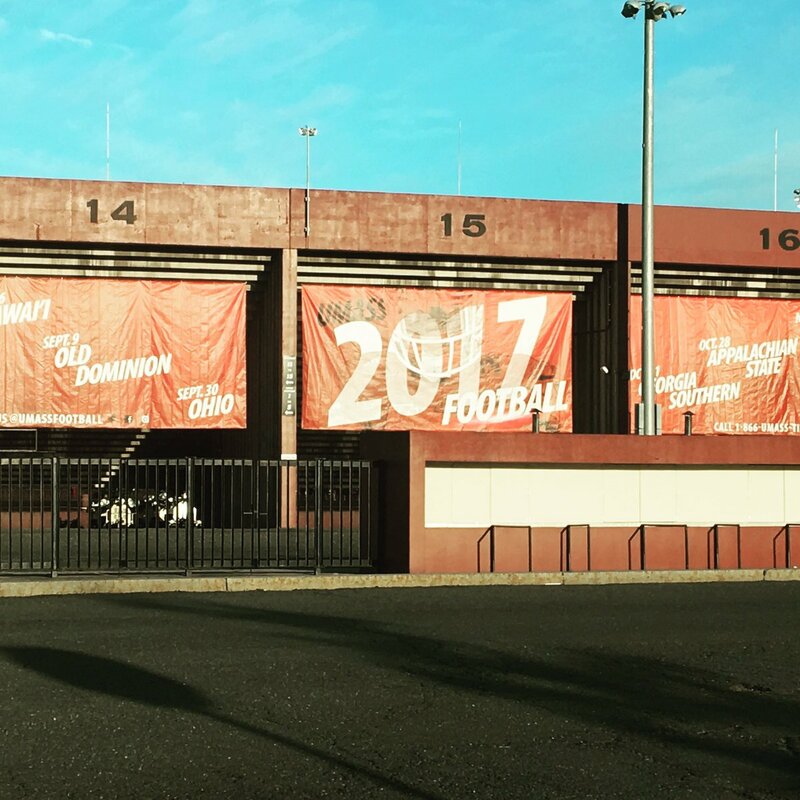 New banners are up at McGuirk. 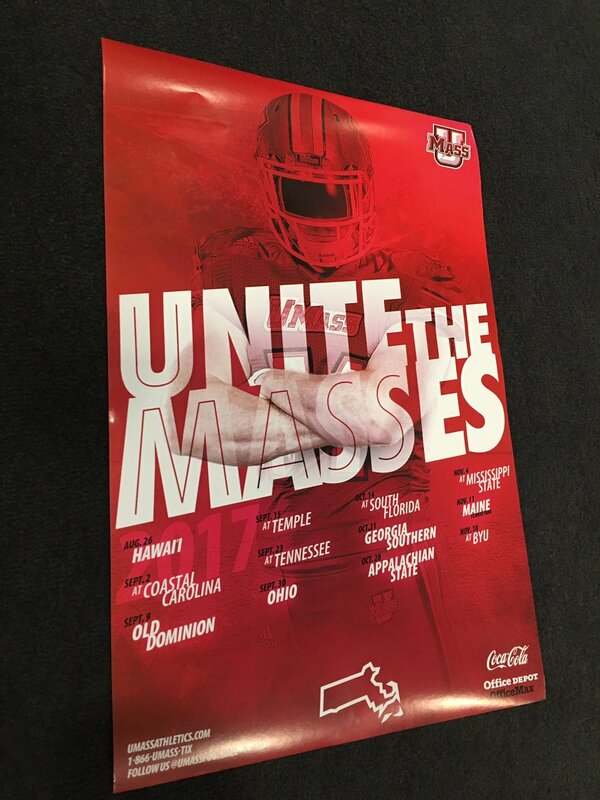 Speaking of McGuirk, UMass 2017 schedule posters are supposed to be available at the Spring Game. This is not official, so we'll have to see when we get there. 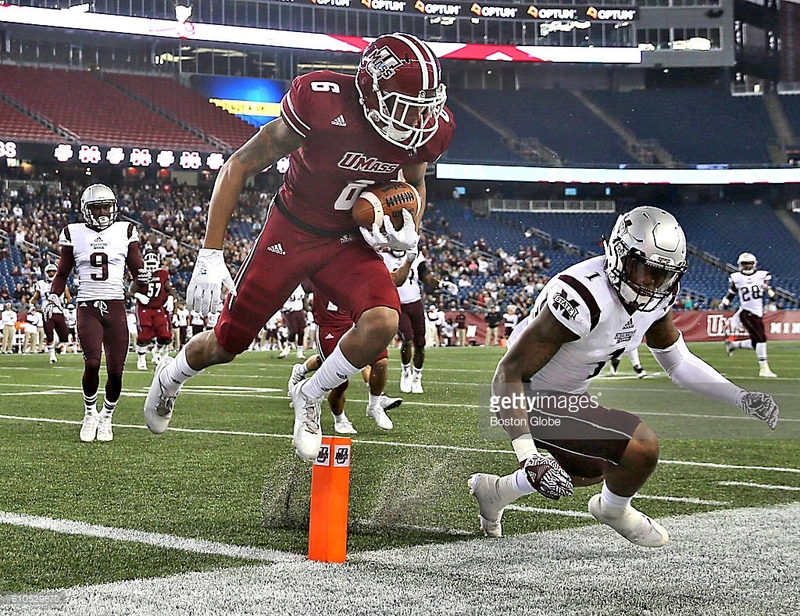 Matty Vautour has a post on UMass receivers Sadiq Palmer and Brennon Dingle. The 6-1 Palmer should be a lock at the "X" receiver. Speedy WR Andy Isabella could be the "Y" or the slot receiver. One or more of the freshmen WR's could see action. Six foot three Patrick Volcy has been in for Spring ball. JUCO WR Jacoby Herring is 6-5 180 should see action right away. Other FR WR's are Athlete Jesse Britt, Jy'Von Brown and Melvin Hill. The American Sports Network has merged with two other media companies. This should be good news for the Group-of-Five sports programs who get mostly ignored by ESPN and other big broadcasters. The NCAA has approved an early signing period for college football recruiting and will now also allows coaches to recruit at player camps and clinics. USA Today has a bullet-list of the changes for 2017 here. Travian Blaylock. 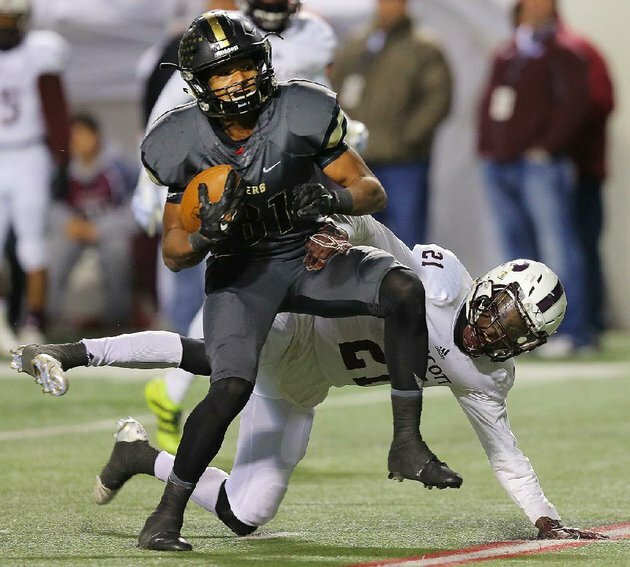 a 6-1 176 pound DB/WR from Humble, TX has Tweeted he's received an offer from UMass. This article from Rivals features Blaylock. Blaylock has eight offers. Besides UMass, he has FBS offers from Arkansas State, Army, Louisiana Lafayette and and Louisiana Monroe. Devin Leacock, a 6-3 270 pound DL from Port Charlote FL has Tweeted he's received an offer from UMass. Almost set the Florida state record on March 9th in Olympic weightlifting. Later on March 23rd tied the record. Besides UMass, Leacock has FBS offers from Eastern Michigan and Appalachian State. 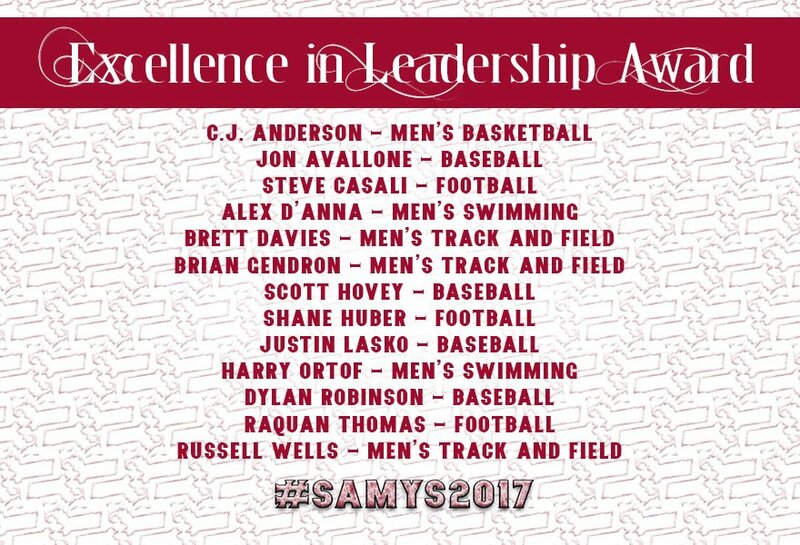 UMass football players nominated for the SAMYS leadership award: Steve Casali, Shane Huber and Raquan Thomas. 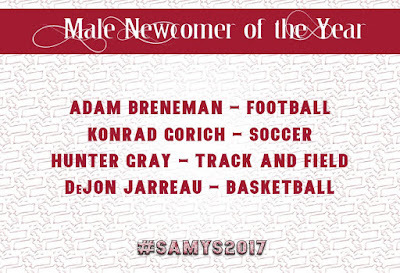 Adam Breneman was nominated for the Newcomer of the Year award. I watched most of Mississippi State's Spring game last Saturday. Bulldog QB Nick Fitzgerald threw four INT's and was not in sync with his receivers. The game ended early when a Mississippi State DB was ejected for a hit on one of his teammates. Old Dominion's Spring game will be this Saturday. 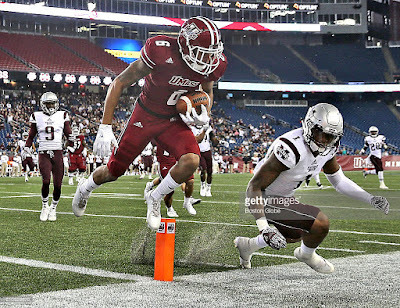 Philip Sanzo of the UMass Daily Collegian has a post on Andrew Ford and UMass young receiver corps learning to work together. Quotes by WR Sadiq Palmer. Palmer went 9-0 GP-GS 9-100 11.1 AVE 1 TD 23 LONG 11.1 ave/game. Palmer also had one rushing TD. Adam Breneman and Andy Isabella accounted for 15 of the Minutemen's 27 receiving TD's last year; twelve came from the WR's. SB Nation has a 2017 projected rankings for all 130 FBS teams. ESPN has an updated "football power index" for UMass and the predicted results for the Minutmen's 2017 schedule. UMass a substantial underdog to Coastal Carolina? A SB Nation writer proposes a C-USA and Sun Belt merger and leaves New Mexico State and UMass out in the cold. Speaking of Coastal Carolina, they had their Spring game on Saturday. Chanticleers SR RB Oshamar Abercrombie looks to start against UMass on September 2nd. 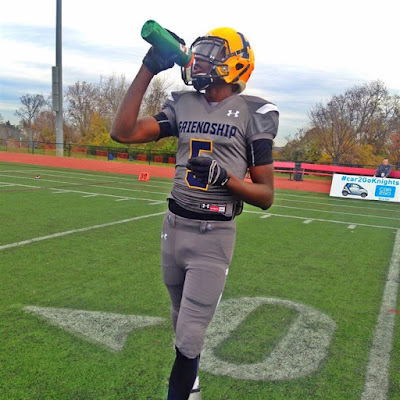 Several recruiting services indicate UMass has offered to Dontay Demus, Jr, a 6-4 205 pound WR from Friendship Academy in Washington, D.C. This article has a profile of Demus. Demus has offers from B.C. Temple, Navy, Maryland, Rutgers, Old Dominion and Wisconsin. 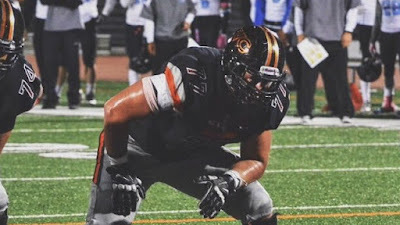 Maisen Knight, a 6-5 311 pound OL from Ventura College in CA has Tweeted he's received an offer from UMass. Ventura College profile page here. First Team All-State in HS. Knight has offers from Houston, Idaho, Nevada, Old Dominion and SMU. Video of the Western Massachusetts National Football Association's meeting with remarks by Coach Whipple is available here. Fan Sided has a story on the Kansas City Chiefs working out Khary Bailey-Smith. Athlon Sports ranks the starting QB's for all 130 2017 FBS teams. Andrew Ford is #68 ahead of all but a couple teams in our 2017 opponent schedule. The Virginia-Pilot says Conference USA will have to change to adapt to a changing TV market. If Conference USA splits into an East and West division, I would think UMass would consider making a bid as a football-only member. If you missed it, Amherst College has dropped the "Lord Jeff's" sports nickname and has changed to "the Mammoth's". Texas Aggies WR Kirk Merritt explains exposing himself to two female academic tutors on "a bad case of jock itch"
Keli'l Montibon, a 6-4 285 pound OL from Riverside C.C. and Honolulu, HI has Tweeted he's received an offer from UMass. This article from Rivals.com features Montibon. 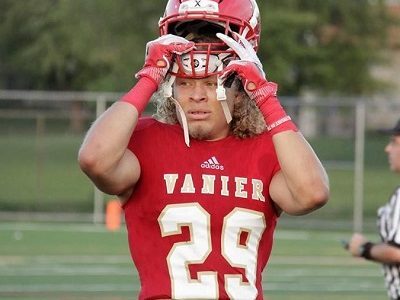 Montibon has nine FBS offers from all over the country. Besides UMass, UConn has offered from the Northeast. Matty Vautour has a post on UMass RB Marquis Young. UMass has two scholarship RB's on the roster for 2017. Matty goes on to relate Khari Bailey-Smith has worked out or will be working out for a number of pro teams. CSN Northeast.com has a post on Bailey-Smith working out for the Pats. Per Mike Traini at "Fight Massachusetts" the Minutemen will hold their second Junior Day of 2017 this weekend. Adam Breneman talks about leaving Penn State and his friendship with current Nittany Lion TE Gisicki. Mississippi State will have their Spring game today at 4:00pm. The game will be on the SEC Network and a couple of the ESPN clones. 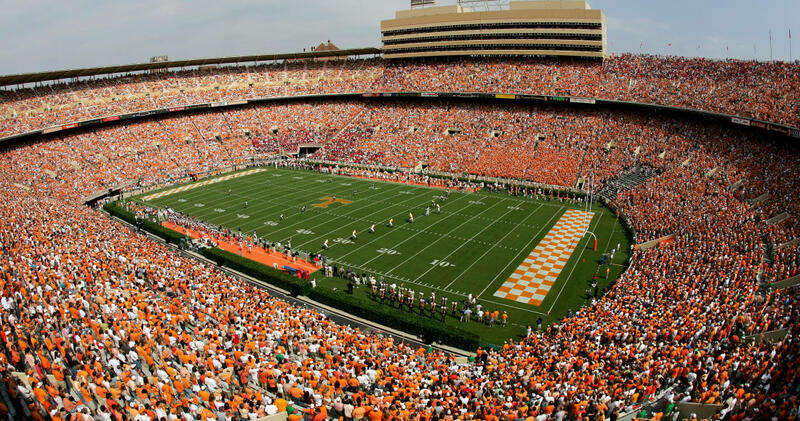 SEC Country has five things to watch for in the game. The Minutemen will tangle with the Bulldogs in Starksville on November 4th. 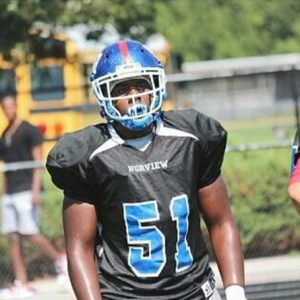 Derrick Eason, a 6-4 240 pound DE from Norfolk, VA has Tweeted he's received an offer from UMass. Besides UMass, Eason has offers from Old Dominion, East Carolina and Charlotte . 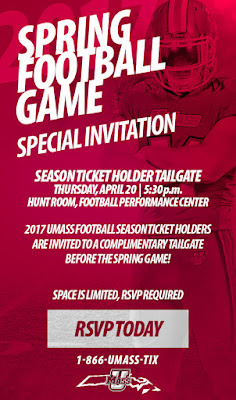 UMass has a post on the 2017 Spring game. 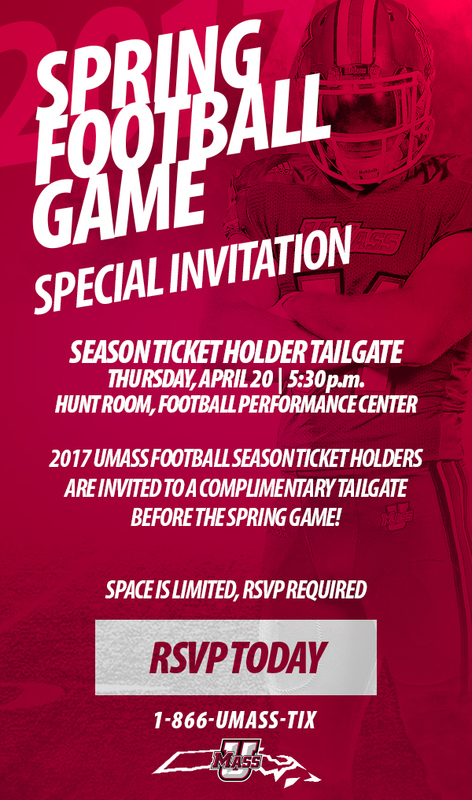 Season ticket holders can attend a special pre-game tailgate in the Performance Center. Hope to see everyone there! Deseret News breaks down Spring camps for BYU's 2017 opponents. BYU's QB Tanner Mangum struggles with depression and anxiety. UMaine starts Spring ball looking for a QB. The Black Bears also lost Temple transfer Zaire Williams to academic problems. Former Black Bear RB Zedric Joseph has been convicted of first degree murder. Sean Michael Flanagan, a 6-2 192 pound Athlete from Charlestown HS in AR has Tweeted he's received an offer from UMass. Besides UMass, Flanagan holds an offer from Arkansas State. 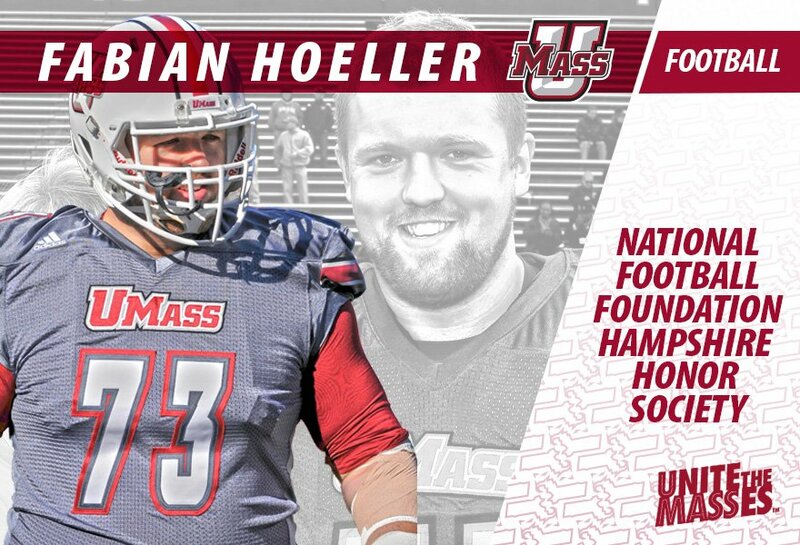 UMass senior Fabian Hoeller has been named to the 2017 National Football Foundation Hampshire Honor Society. 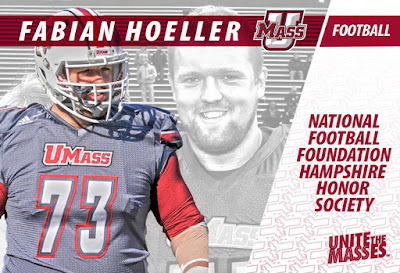 Hoeller had 39 career starts for the Minutemen. Congrats to Fabian for getting it done in the classroom as well as the football field. As Matty Vautour reported yesterday Lukas Kotler or Derek Dumais will probably be his replacement at center. One thing I meant to mention in yesterday's blog post is the setup of the UMass line will be a little different due to Andrew Ford being left handed. Usually, your left tackle (on the QB's blind side) is the team's best pass blocker. The right tackle is usually the best run blocker as most teams run right more than they do left. With Ford as a lefty, this will probably be reversed. BYU has been ranked #48 in the preseason College Football Power rankings. 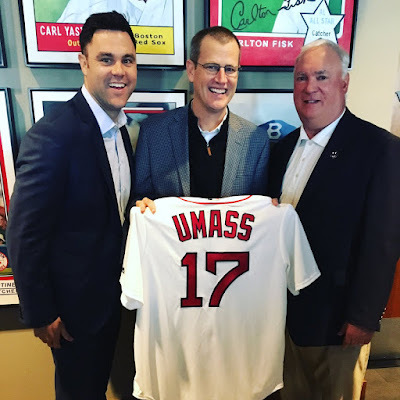 UMass is ranked #114 with a predicted record of 4.1 wins and 7.9 losses. Matty Vautoru reports the UMass offensive dedicates the 2017 season to the memory of Michael Boland. First thought: That's a pretty young OL. One objective for 2017 would be to run the ball better. The Minutemen were #124 out of 128 FBS teams in rushing offense (99.5 yards/game) in 2016. UMass was also # 126 out of 128 in sacks allowed. Part of those results were the caliber of the opposition. Not many Group-of-Five teams rack up big rushing totals against SEC teams. Boston College was still one of the defensive leaders in 2016. Still, in losses to Tulane, ODU and Hawaii the Minutemen were out-rushed 722 to 457. With only two scholarship RB's on the roster so far, the running game will be an area of concern for 2017. Meanwhile, Temple is looking for a new QB. C.J. 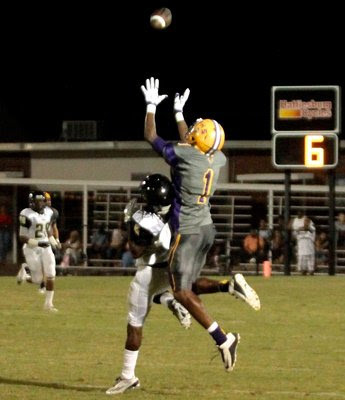 Bolar, a 6-2 186 pound WR from Purvis, MS has Tweeted' he's received an offer from UMass. 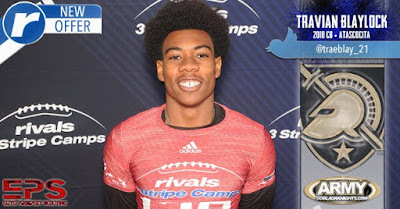 "While Vanderbilt has now offered and joined the race for Bolar, they along with others will have to wait as the 3-star receiver remains patient in his recruiting process. 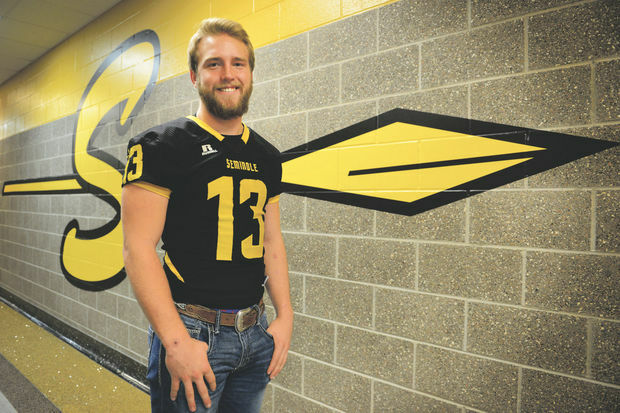 "Well like I said earlier, I have a lot I am dealing with right now, so I'm a far way off from making any decisions on a school," said Bolar. "I know that I have a long way to go before I have to make any choices, so I am going to remain patient, take the steps I need to and make the decision whenever I feel the time is right." This article from CBS.com features Bolar. Bolar holds 15 offers with UMass the only team from the Northeast. Cade Barnard, a 6-3 210 pound LB from Seminole, TX has Tweeted he's received an offer from UMass. UMass is Barnard's first FBS offer. Drawing interest from Texas Tech and other Texas schools. Jeff Lajoie of the Hampshire Gazette profiles new UMass DL coach Dave Wissman. Wissman will have more defensive line depth this year. That may have been part of the reason to switch to a four-down front. I would speculate Ali Ali-Musa, Sha-Ki Holines and Mario Patton would be three of the starting four DL. That would leave one position open. Joe Previte played well before suffering an elbow injury late in the season. Underdog Dynasty previews the 2017 Sun Belt conference. UMass will be an honorary member this year as we play Georgia Southern, Appalachian State and Coastal Carolina. Georgia Southern returns to their signature option offense this year and ran for 371 yards and five TD's in their Spring Game Saturday. 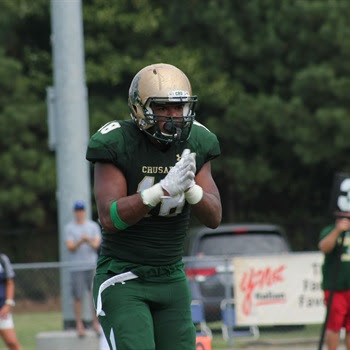 Jeremy Banks, a 6-2 210 pound RB from Cordova, TN has Tweeted he's received an offer from UMass. 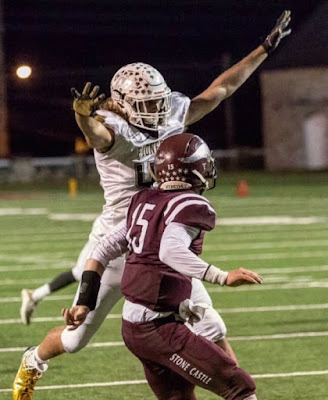 "Banks impressed not only on the proverbial "eyeball test" thanks to his linebacker-like size, but he recorded vertical of more than 34 inches and a powerball throw of 43 1/2 feet, good for one of the top throws of the event. This past fall, Banks ran for 823 yards and 16 touchdowns on almost six yards per carry. In addition to his visit schedule, Banks said he's working hard as he prepares for his senior season. "I'm working on my speed, my power, and agility," he said. "I have to be dominant." Banks holds offers from UMass and Memphis. He has visits scheduled to South Carolina, Kentucky and more. 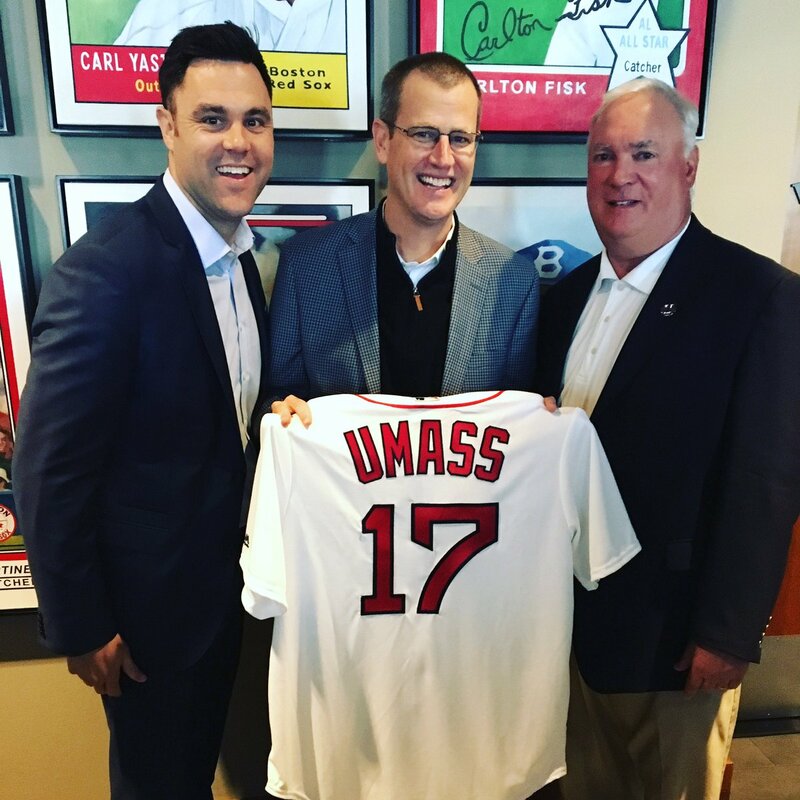 AD Ryan Bamford Tweets UMass has already sold more new football season tickets than we did all 2016. 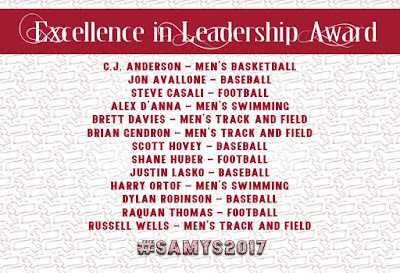 Former UMass football player and long time Hoosac Valley football coach Joe Doyle to receive the Henry A Butova Awward. 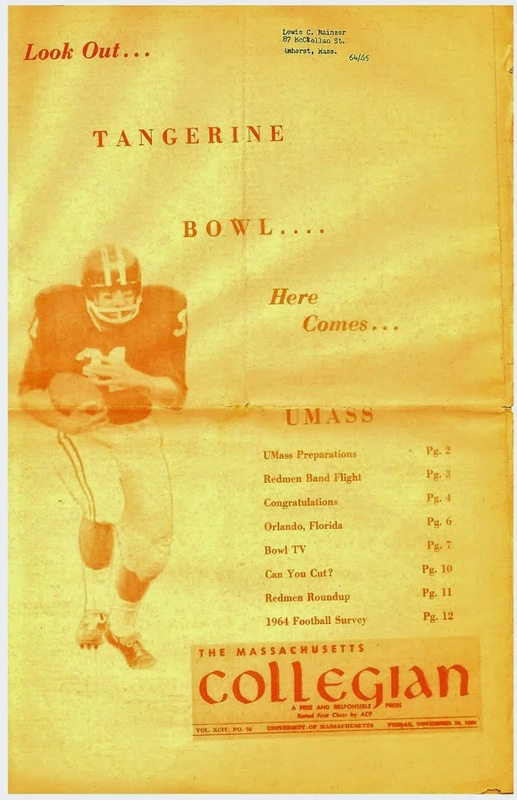 Joe Doyle lettered at UMass in 1963 and 1964. – Total donors have grown from 7,006 to 13,261 (a modest 89.3 percent growth)"
Coastal Carolina, UMass' 2nd 2017 opponent has scheduled two games with South Carolina. The last time the Chants faced the Gamecocks, they lost 70-10. The Minutemen will play Coastal Carolina again in 2018 at Amherst. Meanwhile, there are allegations that the Chants cheerleading squad have been bad girls.